These are Dad's paintings of Ezra's Tomb. He had seen the actual monument, 60 miles north of Basra in Mesoptamia (Iraq), during his Army service in the Great War of 1914-1918. Visit Wikipedia for a history of Ezra's Tomb. 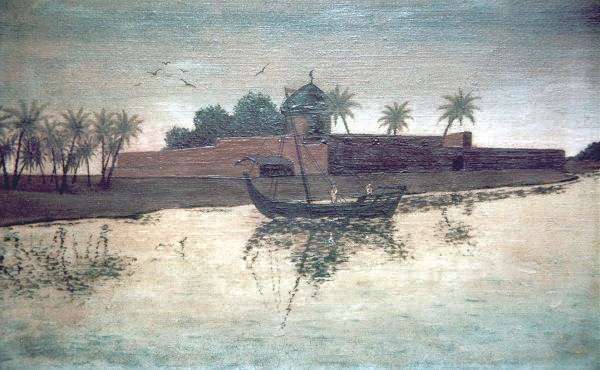 Above: A watercolour sketch that Dad painted in the autograph book of his future wife. It is signed "F.L. Ball", dated March 1919, and measures 5 x 4 inches. survived: only this colour photograph remains. 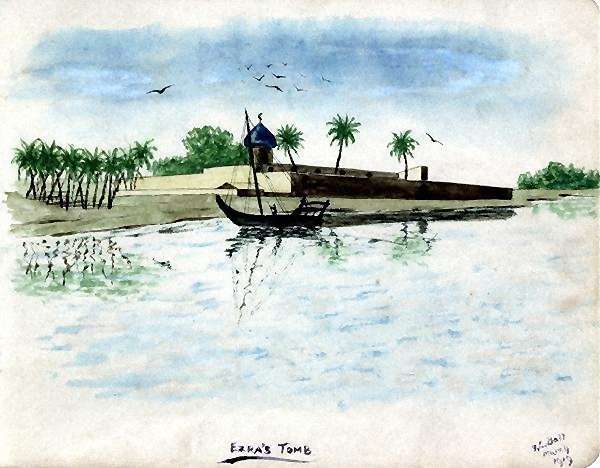 The second night we spent at Ezra's tomb, which is a clump of trees and a few mud houses, and beside them, just on the bank, a domed mosque and courtyard of yellow brick, with some simple but beautiful glazed brick of a dark green colour built into the walls in bands and splashes. It is the most elaborate building between Basra and Ctesiphon. The full text of Lawrence's letter is available on-line on the T. E. Lawrence Studies website.